The market is segmented by Type of Treatment, Mechanism of Action, Route of Administration, and Geography. The psoriasis drugs market is expected to register a CAGR of 9.3% during the forecast period. 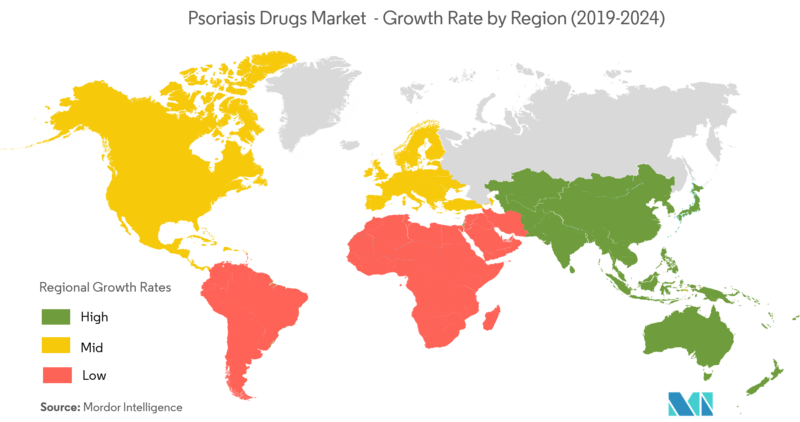 The primary factors that are responsible for the growth of this market include the increasing disease burden and demand for psoriasis medicines in emerging economies, the increasing use of combination therapies, and the increase in psoriasis research and pipeline drugs. Among all these factors, one of the factors expected to have a major impact on the market growth is the increasing use of combination therapies. Research is continuing on this combination therapies approach. However, studies conducted suggest that it often eases psoriasis symptoms more effectively than either treatment by themselves. Biologics usually take a while to work. Combining a biologic with a faster-acting systemic drug, such as cyclosporine, is usually much more effective and safer. With faster, longer-lasting results and fewer side effects, requiring lower doses, many doctors are prescribing combination therapies, which is, in turn, expected to drive the psoriasis drugs market. However, factors such as side effects of existing medications may have a negative impact on market growth. Psoriasis is a genetic condition which may not be present at birth. This genetic condition may also be triggered by certain environmental and genetic factors. Factors such as the changing lifestyles of people are leading to increased alcohol consumption and smoking, unhealthy diets, and sedentary living, are making people more prone to this condition. Interleukin inhibitors may witness the fastest growth during the forecast period, and the factors aiding these Interleukin inhibitors are their improved safety and efficacy when compared to other psoriasis drugs, and their increased adoption among end users. 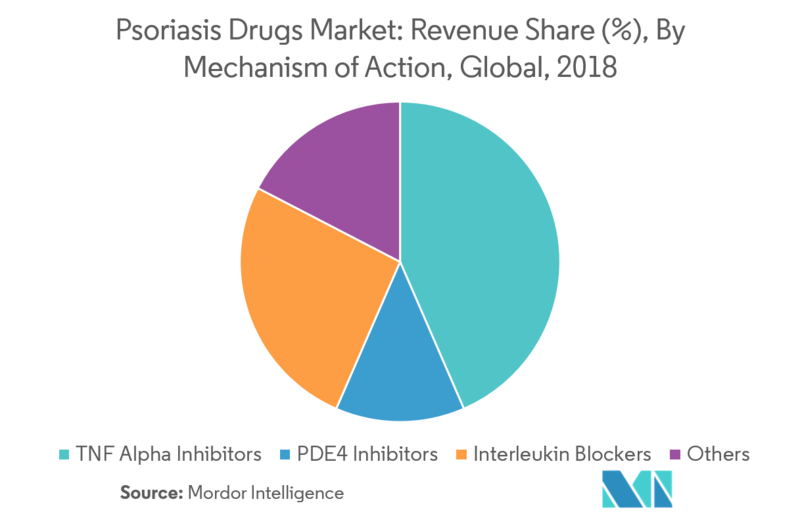 Drugs like Secukinumab, and Ustekinumab, among others, are aiding market growth as the usage of drugs is increasing each year. Another benefit of the IL-mode of therapy is for the patients who are intolerant or contraindicated to TNF-α inhibitor therapy. North America currently dominates the market for psoriasis drugs, and it is expected to continue having a stronghold for a few more years. In North America, the United States holds the largest market share. This can be majorly attributed to the increasing prevalence of psoriasis, the presence of favorable government initiatives, the presence of developed healthcare infrastructure, high adoption of therapeutics, and the presence of key drug manufacturers. All these factors are expected to propel the market in the United States. 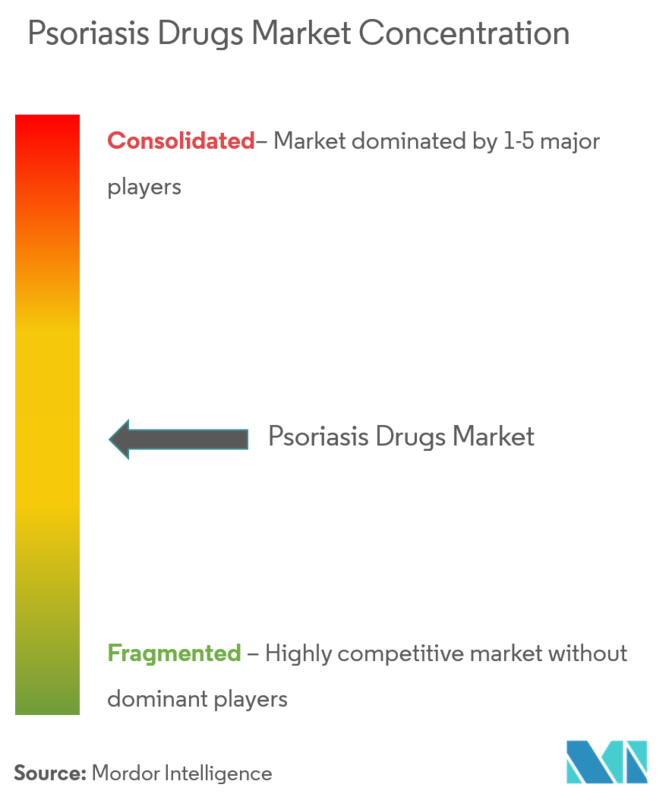 The psoriasis drugs market is moderately competitive and consists of several major players. In terms of market share, few of the major players currently dominate the market. 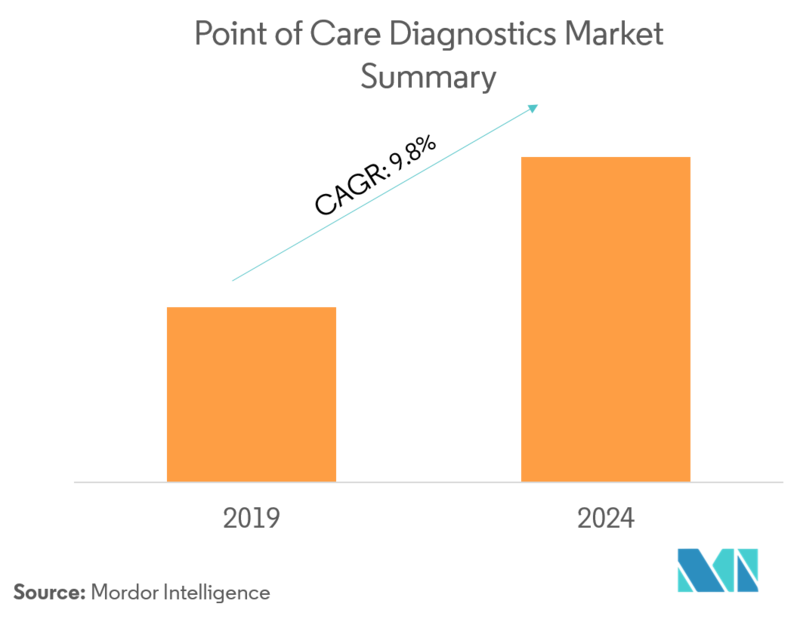 The rising number of patients is attracting a few other players to enter the market, and a few smaller players are also expected to enter the market in the future, who may hold a substantial share. Companies are focused on business expansion in developing regions or emerging markets, such as India, China, and South Korea, by adopting strategies including alliances and acquisitions for development of novel products. Some of the major players of the market are Eli Lilly and Company, Pfizer Inc., Johnson and Johnson (Janssen Global Services LLC), Novartis AG, and Amgen Inc., among others.